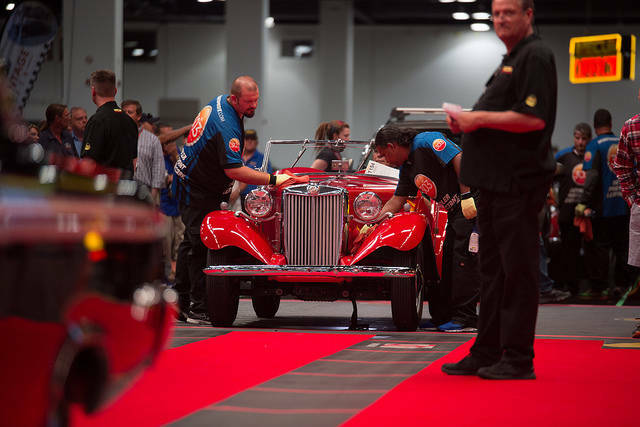 Mecum Auctions will produce its first-ever Las Vegas collector-car auction Nov. 16-18 at the Las Vegas Convention Center. The event will feature an estimated 1,000 American muscle cars, classics, Corvettes, hot rods, resto-mods and more to cross the auction block from approximately 20 surrounding states and Canada. Mecum Auctions Mecum Auctions took the collector-car auction action to Denver in July with 591 vehicles on offer. In just two days, 411 vehicles sold for a 70 percent sell-through rate and an overall sales total of $11.4 million. Mecam's Nov. 16-18 auction in Las Vegas will feature an estimated 1,000 vehicles. Among the “main attractions” consigned to date for Mecum Las Vegas 2017 is a well-documented 1965 Shelby 289 Cobra Roadster that retains its original aluminum body, red seat covers, 6-inch chrome wire wheels and remains one of the most original automatic-equipped Cobras in existence. Another headliner is a 1958 Mercedes-Benz 300SL Roadster that is documented with a copy of the original build sheet confirming its matching-numbers chassis, body, engine, four-speed transmission and differential. Also included among the “main attractions” is a well-documented two-owner 1970 Plymouth Hemi Superbird that stands as one of the most original and highly optioned Hemi Superbirds known to exist. Several private collections will round out the quality consignments with collector Les Quam bringing 11 highly desirable vehicles, including a 2005 Porsche Carrera GT, five Vipers and a ’68 Yenko Camaro. Barry Walston also will bring a selection of vehicles with six of his finest ’30s Fords and more set to be offered at no reserve. Mecum Las Vegas 2017 is open to buyers, sellers and spectators. Bidder registration is available online in advance for $100, $200 after auction start, and includes admission for two to the three auction days. General admission tickets are available in advance online for $20 per person, per day, and for $30 at the door and online once the auction begins; children 12 and younger receive complimentary admission. Doors open daily at 8 a.m., with the vehicle auction beginning at 1 p.m. on Nov. 16 and at 10 a.m. on Nov. 17 and 18. Mecum Las Vegas 2017 will be broadcast on Facebook Live a total of 12 hours. A live stream of the entire auction will be presented at Mecum.com. Persons interested in consigning a vehicle to be auctioned at Mecum Las Vegas 2017 should visit Mecum.com or call 262-275-5050 for complete details about the consignment process and pricing. Mecum’s website is updated daily.